Chris Laudani, the mystery man who shoveled snow off the finish line at the Boston Marathon after a blizzard, becomes part of the race's storied history. Kathrine Switzer became the first woman to ever run the Boston Marathon in 1967. Ellison Brown coined the name “Heartbreak Hill” when he passed hometown hero Johnny Kelley in 1936. Geoffrey Mutai ran the fastest marathon in history in 2011, finishing in two hours, three minutes, two seconds. A double-amputee, Celeste Corcoran, crossed the finish line with her family in 2014, a year after the tragic attack that changed so many lives forever. You could understand why Chris Laudani, the mystery man who shoveled snow off the finish line, feels as though he doesn’t belong in that group. But the symbolism of that simple act, and the impact of the word “FINISH” in bold blue lettering, are both very powerful. 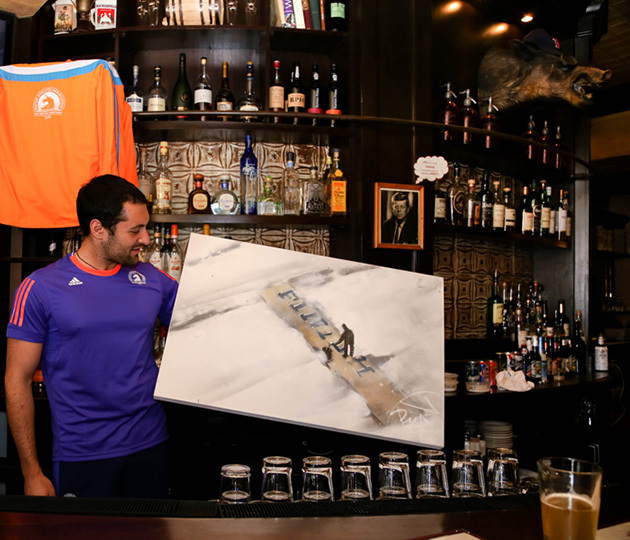 Maybe that’s why Boston graffiti artist Percy Fortini-Wright teamed with Adidas to immortalize Laudani among five paintings depicting iconic moments in Boston Marathon history. Laudani was given the painting, and Adidas will auction off the four other paintings on Paddle8 from April 17-27, with the proceeds going to The One Fund. Laudani was only acting on impulse that cold Tuesday, in the middle of a blizzard that walloped the city with two feet of snow, but he simply couldn’t stand to see his favorite spot in Boston covered in snow—not given all that spot means to him. Unfortunately, there are also some painful memories because of the attack in 2013, but thanks to the seemingly inconsequential act of shoveling the finish line, he can play a part—albeit an indirect one—in helping to ease that pain. There have been some perks to his overnight viral popularity—Adidas will be putting both he and his brother in the race, and sending them all the necessary equipment. He’s not accepting every gratuity sent his way, though as he passed up an invitation from Red Sox third baseman Pablo Sandoval to attend the home opener at Fenway Park. “I was working that day," says Laudani. "I couldn’t make it." He wasn’t complaining, though—he works at Back Bay Social Club, which has a perfect view directly across the street from the finish line, his favorite spot in Boston.